In Print (Delivery period: 14 days). Reading Hobbes in light of both the history of ethics and the conceptual apparatus developed in recent work on normativity, this book challenges received interpretations of Hobbes and his historical significance. 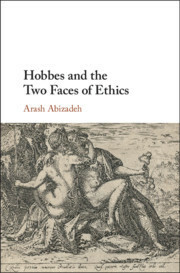 Arash Abizadeh uncovers the fundamental distinction underwriting Hobbes's ethics: between prudential reasons of the good, articulated via natural laws prescribing the means of self-preservation, and reasons of the right or justice, comprising contractual obligations for which we are accountable to others. He shows how Hobbes's distinction marks a watershed in the transition from the ancient Greek to the modern conception of ethics, and demonstrates the relevance of Hobbes's thought to current debates about normativity, reasons, and responsibility. His book will interest Hobbes scholars, historians of ethics, moral philosophers, and political theorists. Preface; Introduction; Part I. The Metaethics of Reasons: 1. Naturalism; 2. Mind, action, and reasoning; Part II. Reasons of the Good; 3. Subjectivism, instrumentalism, and prudentialism about reasons; 4. A theory of the good: felicity by anticipatory pleasure; Part III. Reasons of the Right: 5. Accountability and obligations; 6. The laws of nature, morality, and justice; 7. Rational agency and personhood; Conclusion: naturalism and normativity. Arash Abizadeh (M.Phil. Oxford, Ph.D. Harvard) is Associate Professor at the Department of Political Science and Associate Member of the Department of Philosophy at McGill University, Montréal. He has published extensively on Hobbes in journals including the Journal of the History of Philosophy, The Historical Journal, Philosophers' Imprint and Modern Intellectual History.